PUCKS FOR PAWS at the Syracuse Crunch. 1 week from today, Saturday March 25 vs. Utica Comets. Bring your dog to the game (and occasionally a horse). 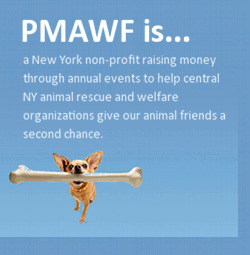 Proceeds to Priscilla Mahar Animal Welfare Foundation helping CNY animals and animal rescues. This entry was posted on Sunday, March 19th, 2017 at 6:19 am	and is filed under Uncategorized. You can follow any responses to this entry through the RSS 2.0 feed. Both comments and pings are currently closed.